I’m working on the design of a side table and I’ve hit a wall. I’m having trouble finding a solution to installing the bottom shelf in this table. Image attached/posted below. At first I thought I would just glue blocks to the stretchers below the shelf (with the grain running from left to right from a font view) and use a screw from under the block up into the shelf with zero slotting. At the back, mount the shelf with a slotted screw so that all the movement occurs at the back. Anyone have any thoughts on this idea? 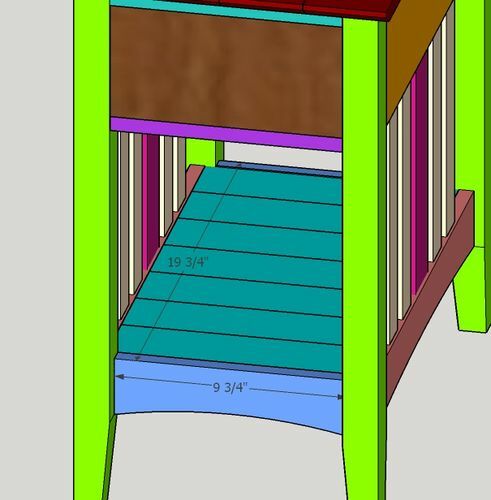 A better idea I think (though I’m not sure how to make it work) is to make a tongue and groove of sorts in the frame around the shelf and slide the shelf in from the back. 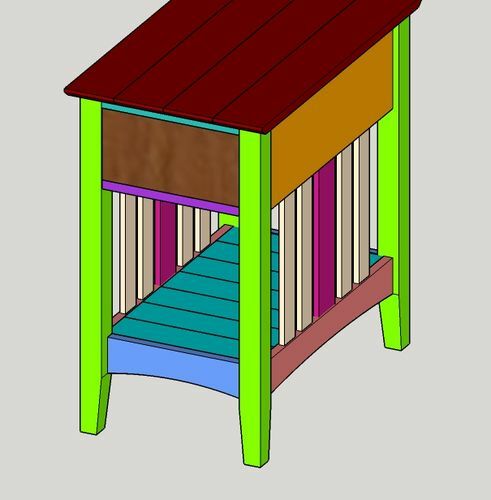 The problem is the back legs are in the way and if I move those bottom rails inboard to clear the legs those vertical slats will become angled and that seems like an eye sore. Again, does anyone have thoughts on this? Lastly if anyone knows the traditional way this would be done I would greatly appreciate someone taking the time to explain this to me. Thanks in advance to everyone. You could move the upper rails to align with the lowers. For traditional approaches, check out vintageinternetplans.com There are several pieces using different methods. If you end up capturing that lower shelf inside the rails, be sure to leave some room for seasonal changes in dimensions. Can’t you just assemble the shelf, bottom rails, risers (slats) and top rails as a sub assembly and then attach that to the legs? Run the boards in the other direction, that makes the width narrower and less movement, glue them together rest them on cleats front and back and screw in from underneath with a single screw in the center. Cut notches for the legs and leave a 1/16” gap on the sides to allow for movement. This or, leave the boards as you show them, but lower the end rails enough so that the bottom shelf lays on the top of these rails (and maybe even over hangs a bit). Now you can use figure 8 fasteners or other “table top” fasteners (a couple on each side, not ends) to provide for movement.